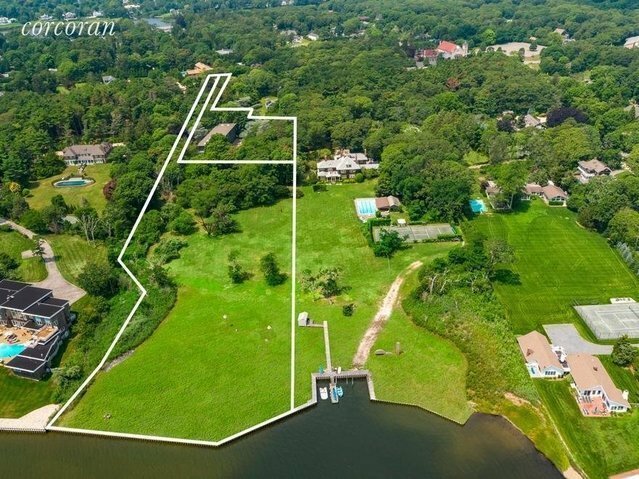 A once in a lifetime opportunity exists here within the quiet hamlet of Quiogue conveniently located between Westhampton Beach and Quogue and just moments to all conveniences, houses of worship and pristine ocean beaches. 5.2 Acres comprised of two parcels with newly bulkheaded water frontage The incredible 7500 square foot "art barn" structure housed the private art collection which is a climate controlled 2 1/2 story galvanized steel building on a separate parcel. Endless possibilities exist as a private gallery space or car collector's warehouse while easily re-purposed as an additional guest house with a main house on the single and separate 3 waterfront acres. Be the next owner of this private enclave 1.5 hours to New York City and just 10 minutes from Gabreski Airport. Offered exclusively and by appointment only.